Language Log » Whose values? 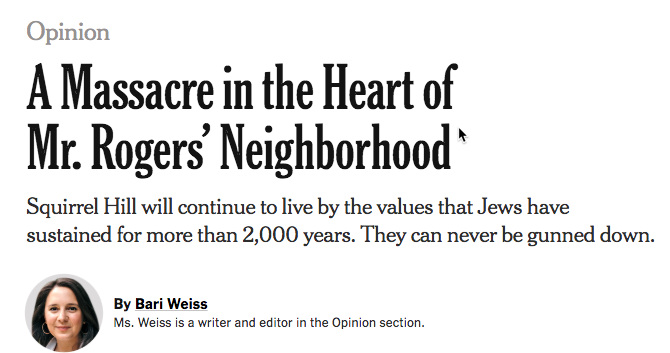 My first reading was that Ms. Weiss was speaking up in support of Bowers' apparent motivations of anti-semitism and political murder. This seemed improbably contrarian, but these days, who knows? Is this because the noun values has an implicit propositional structure, with something like an experiencer argument? And is this part of its lexical meaning, or just an issue that arises in the course of discourse interpretation? There are two reasons why we initially misread this statement. First, we assume that people are driven by their own values, not by (their reactions to or views of) the values of others. Second, it is contrary to what we already know the facts to be: The killer did not seek to attack values; he attacked Jews, regardless of their values. Looking at the first few pages of hits for "the values that drove" in the google books corpus suggests that the natural reading would indeed the one that you thought seemed improbably contrarian. I think one other thing going on here is something about the semantics of "drive," because there are lots of other phrases of the form "X drove Y to do Z" where X is something Y reacts to negatively, with Z being a predictable if perhaps unfortunate negative reaction to X. But when X is "values" that reading seems less available. Maybe if you said "X's values drove its/their opponents/enemies to do Z" it could still be read that way? I assume that what happened here is that she intended to emphasize that the killer was particularly angry about HIAS, so he was killing people because of their values. But yeah, it sure came out weird. FWIW, in my reading, the confusion comes from the fact that the first identified actor after values is the killer, so I attribute the values to the killer. If the sentence had been written to mention the victims closer to the word values (e.g., "The values my neighbors held that drove X to murder them are ones we also cherish…. "), then there would have been far less confusion on my part. mikegrubb's alternative also works. I wonder if whoever wrote this thought the intended meaning would flow smoothly from the headline proper: i.e., assumed that since that ends with "Mr. Rogers' Neighborhood," the NP "The Values" at the beginning of the subhed would be easily interpreted as "the benign and non-violent values stereotypically associated with Mr. Rogers' Neighborhood." But any such expectation was inaccurate, it would seem. The original headline inadvertently hit on a way more profound truth about American culture. I hope this won't come across as excessively peevish, but it more than annoys me that the media continue to use language that appears to claim that the victims of terrorism somehow caused their misfortune. Even if we take a 100% causal views of events that's not plausible — when a plane crashes we don't say that the dead were killed by their choice to fly. Yet with terrorism we get this nonsensical mish-mash of causal and intentional language that benefits no one except perhaps the terrorists themselves. There are many many possible ways of expressing what the writer was seeking to communicate, but for me something along the lines of "the values held by my neighbours which ultimately led to their murder are values that we also cherish …" seems close to optimal. I read it the same way (i.e. referring to Bowers's values) but in a completely different context. I thought it was intended to mean something like "I disagree with the use he put his guns to, but I support his right to bear them". That *was* my interpretation. 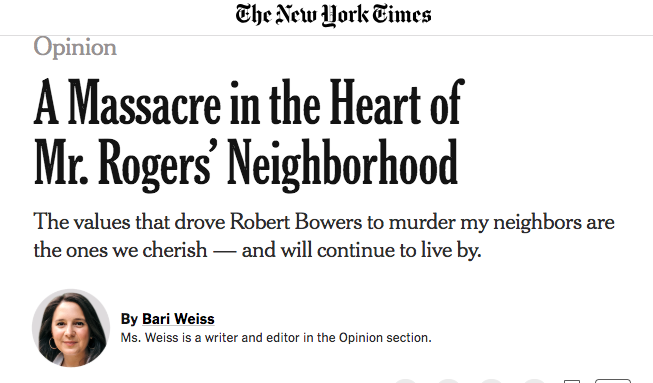 My first impression was not that the writer supports anti-Semitism, but that the shooter held Mr. Rogers' Neighborhood values. My confusion was therefore with how ideas of love and harmony lead one to shoot up a synagogue. Am I the only one NOT to have been confused? I instinctively think of values as positive (unless being ironic), so it did not occur to me that they could have been the driver rather than the hypothesised target. I know that it was actually people who were targeted, but I am quite used to politicians and journalists talking about terrorists attacking values, so that seemed unexceptional. I hope this won't come across as excessively peevish, but it more than annoys me that the media continue to use language that appears to claim that the victims of terrorism somehow caused their misfortune. I think you're not being peevish *enough*. The verb choice in the original subhead was "drove". That is not a verb that is vague about agency. That is quite direct and up front about who was in the driver's seat. You couldn't more clearly state "they were asking for it" without using those exact words. Saying "hatred and conspiracy theories drove Bowers" would still be a reprehensible attempt to let him off the hook for his own choices by pinning them on some impersonal force, but at least that wouldn't be victim-blaming. Ambiguity is the least of the problems here. It's hard for me to dispassionately consider the linguistic implications of this article, as I personally know Daniel Leger, one of the surviving victims, who has shown much kindness to my family and who I understand is still in critical condition. That said, Francis Boyle and Chris's comments are especially insightful and I greatly appreciate them. It is unfortunate that headlines are often written under tight deadlines and the opportunity to understand all the nuances is rarely there. This is a case where that opportunity needed to be taken. "Our values, which led Robert Bowers to murder us [or to murder our neighbors], are the ones we cherish…"
Usually I'd agree with you. However, in this case, the killer himself made it clear that he saw Jewish values that cause HIAS to help refugees of whatever background as a reason to hate Jews. I don't think it's blaming us to say that someone hates our values and sees them as so horrible that he wants to murder us. It's something broken in him that makes him hate refugees and anyone who helps them. There is, of course, no doubt that the original headline was erroneous and did not mean what was intended: the only sensible meaning I could extract from it is the one Gwen Katz alluded to: that 'we' referred to Americans and the story was blaming American values for this vicious act – articles like that are not rare, so that is what I would have to assume was meant. Anyway, I think here it is necessary to point out that one can oppose aid to refugees (let's not get into reasons for that) and still oppose these acts of violence. It is especially important here because the contrary implication plays right into their hands: it seems to say that political violence is OK in good causes, and people that already have anti-Semitic inclinations will believe that it it the Jews that decide what are 'good causes'. I say it a foundation of free, civil, society that people be able to express their political ideas with words, not weapons.